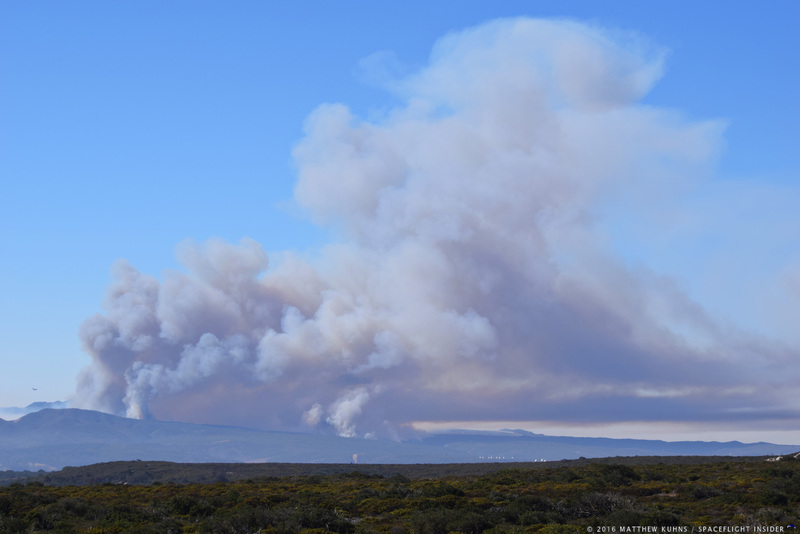 LOMPOC, Calif. — The wildfire that prompted a delay of a United Launch Alliance (ULA) Atlas V rocket scheduled to fly out of Vandenberg Air Force Base’s Space Launch Complex 3-East (SLC-3E) Sept. 18 has yet to be contained. What was a 500-acre fire on Sunday morning has since grown to consume nearly 5,000 acres and continues to burn at what is being described as a “slow to moderate speed”. As the fire worsened, however, base restrictions were put in place. “Effective immediately and until further notice, only mission-essential personnel, as designated by their commander, will be granted access to South Base,” a Sunday evening update stated. There is no restriction for North Base activities. 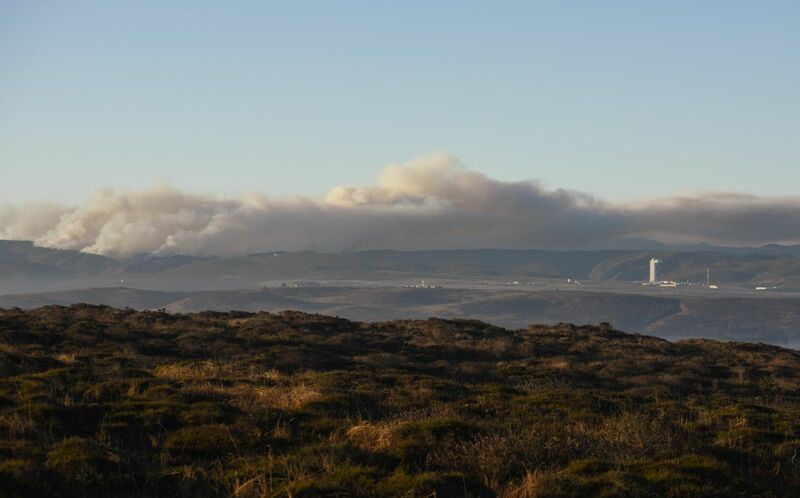 However, an update at 5:10 p.m. PDT Monday (00:10 GMT Tuesday) stated that due to predicted expansion of the fire through the course of the day, access on South Base was limited to emergency personnel only. In a report by Spaceflight Now, two workers were injured and transported to a local hospital for treatment. The 30th Medical Group is also monitoring the air quality at North Base. As of 5:20 p.m. PDT Monday (00:20 GMT Tuesday), the air quality was measured as normal, but sampling will continue throughout the night. 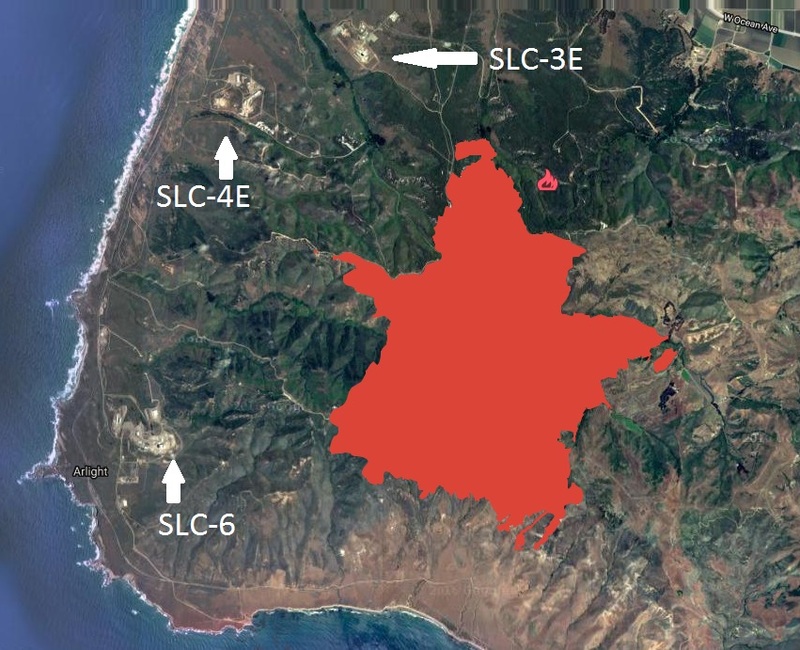 According to the San Luis Obispo Tribune, the fire near the base’s facilities present unique challenges. For example, a “mystery tank” near SLC-6, where Delta IV rockets are launched, was spotted by firefighters and they wanted to know if it was flammable. It turned out to be a water tank; however, the fact the blaze is only a half-mile to a mile from SLC-6 and the other launch pads – SpaceX’s SLC-4E and ULA’s SLC-3E – means potentially dealing with highly flammable materials present around the launch site. To make matters worse, according to the Tribune, firefighters are warning about possible unexploded ordnance leftover from when the base was a training facility during World War II and the Korean War. So far, no buildings have been harmed by the blaze and resources are being put into place to protect facilities from the advancing fire. In addition to the Atlas V and its payload at SLC-6, at SLC-4E, SpaceX has a Falcon 9 rocket with 10 Iridium communication satellites. As of Monday morning, teams were using a helicopter to map fire lines and evaluate the progress of the blaze in order to better place fire fighting resources. So far, only small electrical outages have occurred on the South Base due to downed power lines. Buildings that lost electricity were placed on generator power until commercial power can be restored. The blaze started on Sept. 17 in a remote area in a canyon between Arguello and Santa Ynez Ridge Roads. Dry vegetation and warm weather are fueling the fire. Nearly 800 Vandenberg, U.S. Forestry Service, CalFire, and Santa Barbara County firefighters are on hand to battle the blaze.